GREAT LAKES NAVAL STATION, Ill. -- Who's a good boy? It seems the answer is Gander, a labradoodle from Chicago's northern suburbs. He will be honored in Hollywood this week as the Service Dog Hero of the Year. 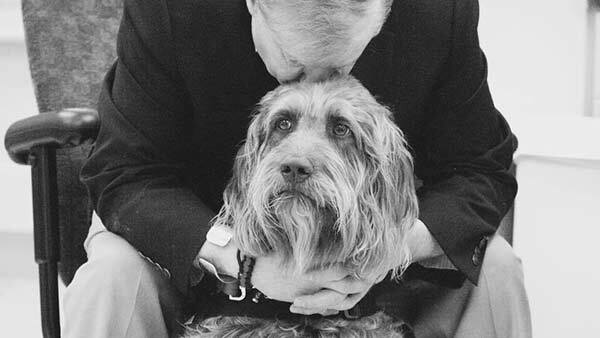 Gander helps veteran Lon Hodge cope with his post-traumatic stress disorder. He's now up against seven other dogs for the title of American Hero Dog. If he takes the top prize, he'll win $7,500 for the charity Canine Companions for Independence. Gander was saved from certain death in Colorado and rescued by a women's prison program in Denver for obedience training. He was then trained by Freedom Service Dogs in Englewood, Colorado. It was there in September of 2012 that Hodge and Gander became a team. They have not spent one day apart since then, and Hodge credits Gander with literally saving his life. In 2014, Gander was the first mixed breed dog to win the American Kennel Club "Award for Canine Excellence." Gander and Hodge travel the United States - 36 states so far - to encourage education and awareness for PTSD, veteran suicide, service dogs and people with visible and invisible disabilities. "If I'm super stressed out, he'll get right in my face," Hodge said. Hodge is a Vietnam veteran and has some mobility issues from an autoimmune disorder. Four years ago, he says his PTSD was so debilitating, he couldn't leave his house. "I was in a lot of trouble physically and emotionally and was having up to five, six panic attacks a day," Hodge said. That all changed when Hodge received Gander, a labradoodle with $35,000 worth of training from Freedom Service Dogs. The organization rescues and trains dogs, then matches them with veterans and others with disabilities. "People ask me all the time, you don't look like you need a dog, and I say, it's because I have a dog," Hodge said.